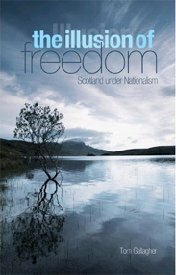 Tom Gallagher's book, The Illusion of Freedom: Scotland Under Nationalism (Columbia University Press, 2011) is the first one to assess the party's performance and goals since it took charge of Scotland's autonomous government in 2007. Here he offers a comparison between the Scottish National Party (SNP) and the Parti Quebecois, drawing out their respective strengths and weaknesses as they struggle to detach themselves respectively from Canada and Great Britain. Scotland is a heavily-urbanised but post-industrial nation which voluntarily renounced its status as an independent nation-state to merge with its larger and more powerful southern neighbour England in 1707. Instead of vanishing into obscurity, its most energetic and ruthless inhabitants played a decisive role in founding and maintaining the British empire. Canada was, arguably, largely a Scottish creation and the intricate compromise between French- and English-speaking inhabitants was brokered and maintained by politicians many of whom had a Scottish background. On 5 May, elections were held for the Scottish parliament which since 1999 has controlled much of Scotland's domestic affairs. 45% of the voters, on a turnout of just under 50% of the electorate, backed the SNP whose main goal is complete independence; this was enough to give the party an absolute majority of seats. Since 2007, the SNP had been in charge of a minority administration and it was thought to have governed Scotland more effectively than the Labour Party which had been responsible for devolving power from London to Edinburgh. It was an endorsement for the SNP's leader, the capable Alex Salmond; in an age of deep scepticism towards politicians of most hues, he has projected himself as 'the people's friend', a trustworthy guy who just happens to be in politics. The 56 year-old Salmond, a lifelong politician except for a short stint as a researcher in a major bank, once described the Parti Quebecois (PQ) as his favourite nationalist movement. But it went down to a shattering defeat in the Canadian general election held in the same week as the Scottish contest. The Quebec separatists have largely been in the doldrums since the 1995 referendum on independence was very narrowly lost . Not least of the PQ's handicaps is the need to turn its attention away from its sacred cause and manage the provincial economy and deliver effective services. The slower rate of growth of Quebec's economy and sharp dissatisfaction at the way education and health have evolved in Quebec compared with the rest of Canada, suggest that the PQ is not especially good at day-to-day administration. Now the SNP will face the same challenges, no longer having the excuse that as a minority government, it's control over the state was always limited one. Arguably, the language issue hinders rather than helps the PQ achieving its goal of full statehood. It is a motivating issue which gives the party durability as well as the support of a range of special interests which have flourished as French has been zealously promoted for over thirty years. But the language issue is also divisive and the militancy with which it has been pursued has bred alienation by no means just among Anglophones. The absence of a cultural marker, like a separate language, distinguishing Scotland from its partner--overlord may have delayed the rise of political nationalism but arguably Scotland's distinctive geography and history are more effective tools from which to build an emotive set of images around which to base a pro-independence appeal. Perhaps the biggest obstacle that the PQ faces is the revival of Canada which when it broke through in the mid-1970s was a dull and anonymous country with an uncertain future. But in recent decades, Canada's story has been one of economic success and growing self-confidence. Booming cities are to be found not just in the west but on the doorstep of Quebec as in the case of Toronto which has surged past Montreal in the last forty years. Canada is one of the few large capitalist states in the northern hemisphere which has managed to escape the perilous post-2008 economic recession. Stephen Harper's espousal of a civilized Canadian nationalism sums up a new sense of pride in Canada. Turning back to Scotland, the SNP still struggles to convince the majority of 5 million Scots that earnings will match expenditure and that independence can occur without searing economic pain. But it has an easier task than the PQ on the economic front. The British economy is anaemic, manufacturing having mostly vanished and its service industries and large financial sector could become major casualties of a prolonged slump in Europe. England's South-East is the only economically dynamic region. There are no booming metropolises in England's North to convince Scots that the Union works economically. Nor are there any British political leaders with authority who can make an eloquent case for the union. Alex Salmond, the SNP's adept and self-confident leader actually overshadows David Cameron and Nick Clegg who head an uneasy Tory-Liberal coalition in London while Ed Miliband, Labour's new leader is ill-equipped to mastermind the recovery of his party on either side of the Anglo-Scottish border. In recent years Alex Salmond has been like an inexhaustible oil well for his party. The PQ has never enjoyed such a commanding leader not even in the heroic days of Rene Levesque. Next to 'SNP', voters when studying their voting paper in May found the words 'Re-Elect Alex Salmond as First Minster'. The danger is that the SNP will become a personal vehicle for a proud and sometimes impulsive leader who pays much greater attention to his media advisers than to many of his elected colleagues. This creates the added risk that success will draw careerists to the party who see it as a means for rapid personal advancement and who are highly pragmatic when it comes to the constitutional future of Scotland. Scotland has an under-performing state which is now largely in Scottish hands. Salmond will have to tackle some of its major inadequacies that have contributed to Scotland having some of the grimmest socio-economic statistics in the western world. If he concentrates on the prize of independence when England is weak and preoccupied with its own problems arising from poor governance, one that eluded the PQ in the 1990s, could yet be his. But it is more likely that the SNP will be unable to persuade a majority of Scots to opt for separation when a referendum on the issue is held before 2016. The latest polling evidence shows that no more than 30% of Scots are ready to back independence. Most prefer the SNP to be a social democratic party which cuts a good economic deal for Scotland within a British state, undoubtedly in decline, but whose authority remains strong. If administering Scottish autonomy is to be the SNP's fate, it will need to be vigilant in order to avoid becoming a party of patronage and clientelism like the PQ; many of its new allies in the media and among business interests whose wealth springs from profitable transactions with the state hope that despite the heroic rhetoric, the SNP will become a party of corporate Scotland. Perhaps deliverance is most likely to come from England which increasingly resembles Scotland as a small neurotic nation, insecure and resentful about issues it would have laughed off in more confident times. If Salmond can rile enough 'Little Englanders' whose complaints about subsidizing their ungrateful northern partner are increasingly vocal, then it may well be England which starts divorce proceedings, bringing to an end a 304-year political union which already has plenty of the hallmarks of a loveless marriage. Tom Gallagher lives in Edinburgh and is Emeritus Professor of Politics at the University of Bradford.